Deceptively real in look and feel. Densely hand-placed rose petals give the flowers a lush fullness. Elegant dialogue between two shapes of flowers and white nuances. Stable colour, strong green foliage. Stems painted in fine detail. Ideal for holiday and wedding tables. 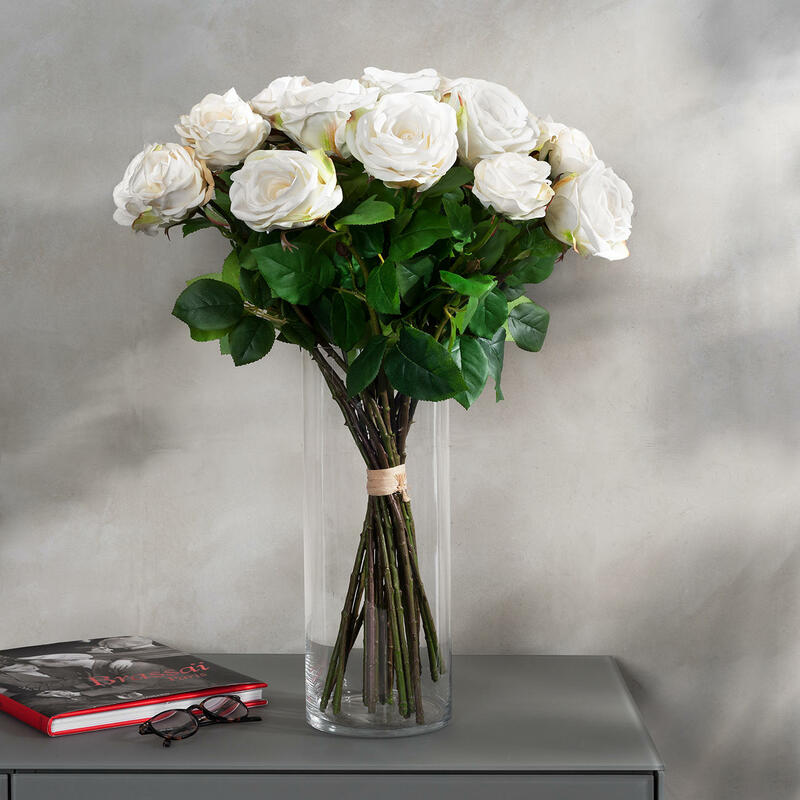 Everlasting beauty: The bouquet with 22 lush white Avalanche roses. Precious long stemmed premium quality. Fascinating and true to nature - just like fresh from the florist. 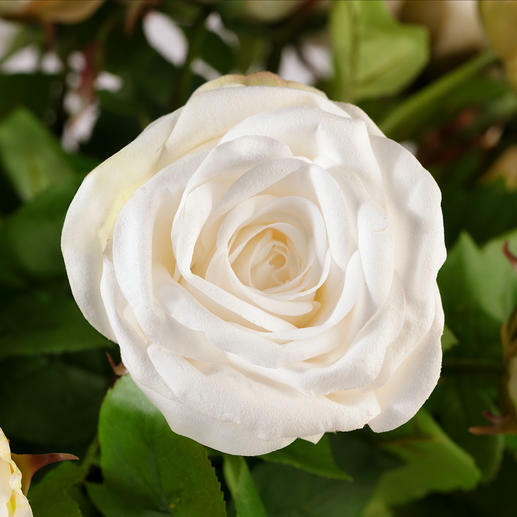 The queen of flowers in a highly elegant presentation: The white Avalanche rose, a proud beauty with 4.3" (!) large, richly endowed flower heads, deep green leafage and sophisticated length of 27.55". With 22 fresh roses in this premium quality, the bouquet would easily cost up to £50. Unfortunately only a short-lived beauty. This lovely true-to-nature bouquet, however, keeps is beauty for years. So you always have fresh flowers in the house, save money and safe laborious care. Forget less valuable bouquets that look fake even from far away. These handmade lovely roses are completely different: even from nearby they look so real, that you just want to sniff them. Through the "real touch" coating, they even feel like natural roses. Each flower is made up of 25 rose petals, which are hand-placed and glued piece by piece. As in nature, every flower is different, but the harmonious look is retained. One shape is fully opened, the other elegantly erect, in the first stage of perfect blooming. Instead of pure white, some of the flower petals have been hand enhanced with soft green. The flowers thus have an even more elegant look, with an understated lively interplay of colour. The stems ensure stability in table and floor vases. The lush leaf green is flexible, you can change the position again and again. The 22 roses come bound into a bouquet, but can also be loosely arranged. Each measures 27.5" long, easy to shorten. Total weight approx. 2.6 pounds. Flowers and foliage: Textile. Easy to dust with a brush or cloth.